We are rotating the first batch of rice we stored away and replacing it with the new batch. 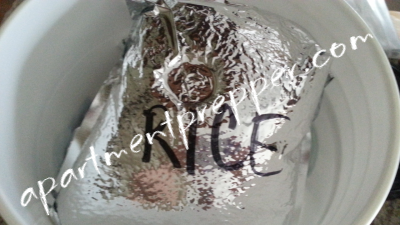 I bought the rice back in April 2010 but did not repackage it for for long term storage until November 2010. Usually, rice that is left in a pantry with no special packaging will last one to two years. Since this is the first time I am using my rice storage I was really curious as to how the mylar bag/oxygen absorber packed rice held up. We don’t keep it especially cold in our apartment – usually 75-78 degrees, and it does get humid indoors sometimes. First, Mr. Apt Prepper opened up the five gallon bucket. I didn’t realize they are not the easiest things to open, which is actually a good thing, because you know the contents are safe. After he released the plastic zip seal, he had to slowly pry open the lid with a butter knife. It would have been easier to have a bucket opener so I added one to the Amazon wish list. Once opened, we examined the mylar bags inside and found them to be the same as when we packed them nearly four years ago. The bags were still very much air tight as they shrink around the food once the oxygen absorber activates. When I opened a bag, I found that the oxygen absorber was still soft and fresh, and did not harden as expired ones do. I poured the contents into a jar, and cooked up a batch. The rice tasted good and there was no difference in taste or texture at all. I am really glad the process works, and feel confident the food storage will hold up for many years. Buying food in bulk and repackaging it yourself is a cost effective way to store for emergency long term storage. As long as you keep rotating your food, it will not go to waste. If you’d like to get started repackaging bulk food for long term storage, the easiest method is described here. The year was 1999. Lost my Job. Cashing in my Investments. I was using my money wisely. Bought Bulk rice At 6(Six) pounds for a dollar. Pinto beans were 5(Five) pounds for a dollar. Well I bought some. Stored it, Rice/Beans, in 3(three liter) pop bottles that had been cleaned out and dried out. Well I had lost track of a few in the store room and found them in 2012. When I opened them I heard the distinctive Whoosh (Airtight container being opened). The beans smelled O.K. and the rice smelled like rice. When I cooked them up they both tasted fine. That is Twelve years stored in plastic airtight containers. 12 YEARS. Hi ed, Great to know 12 year old rice and beans turned out fine. Thanks for sharing this with us! 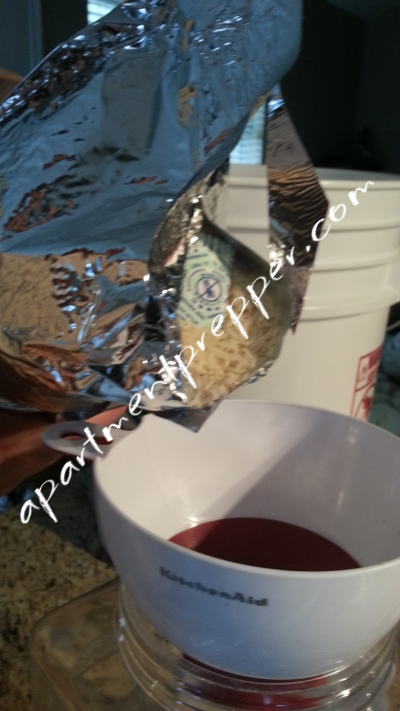 I have rice in a bucket, no O2 absorber, no mylar bag and using a gamma seal top. It is probably 7 years old and tastes great. I use it irregularly. Don’t know about the nutritional value though. Thanks for the article! Hi Don, That’s great your rice turned out fine too – 7 years with just the gamma seal top! Thanks for the comment. I have (16) 5 gallon buckets of rice. I have no plans to get rid of it–it is long term…which is what rice is meant to be. No absorbers, no mylar–just rice in the bucket with DE for insects. Please, people. Stop making this so hard—it’s rice. Not gold. That is fine if you live in a dry cool environment. Since we live in a hot, humid area, I prefer to go the extra mile and pack my long term storage items in mylar bags with oxygen absorbers. It’s more of a small insurance against food going bad when we do need it. Buckets get more expensive every year–what a waste of space using mylar bags for something like rice. Jayjay- It may not make sense to you but it sure does for us. Keeping the rice in mylar bags with oxygen absorbers keeps the air out, which is is an enemy of food storage. Remember that moisture is the enemy. Oxygen absorbers take out the oxygen but not any moisture. The stock needs to be dry and sealed air tight to keep moisture out. Moisture in a low oxygen environment leads to botulism. This is true-everything must be completely dry and air tight as you pack food for long term storage. I just got one of those bucket openers in the paint department at Lowes for less than $2.00. Joan, I just bought another bucket opener. 2 is 1, and 1 is 0.